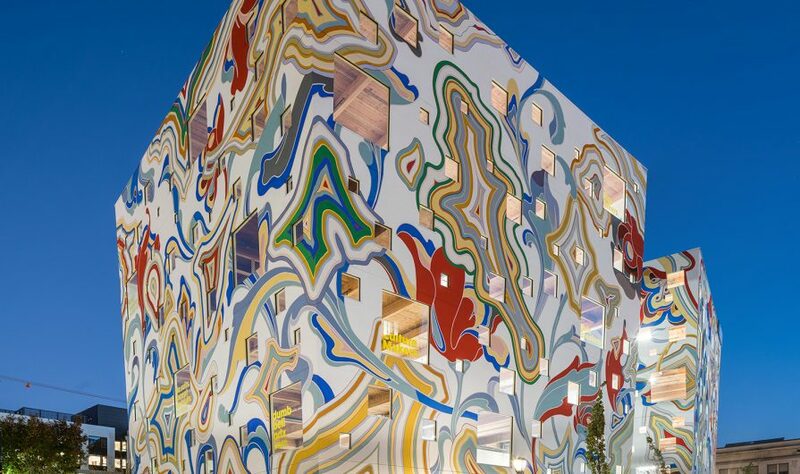 The Fair-Haired Dumbbell is a collaboration between the architect and developer. 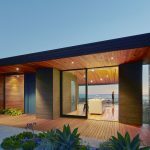 Structurally supported by mass timber sourced in the Pacific Northwest, this 56,389-sq.ft. 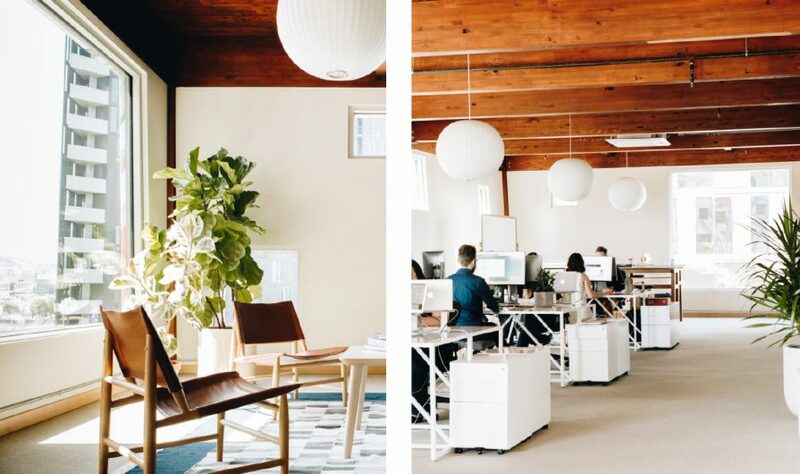 office building with ground-floor retail is located in the heart of the Burnside Bridgehead developments. 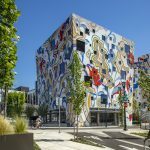 At the east side of the intersection of Burnside Street and the Willamette River, the Bridgehead is home to some of Portland’s most exciting and interesting new architecture. Completed in 2017, the Dumbbell’s starting point was a small, challenging “island” site, bound by busy streets on all sides. In order to maximize useful space in the area, which measures just over a quarter-acre, the design team incorporated small interconnected public plazas that flow into the ground-floor retail. These provide refuge and facilitate pedestrian movement and visibility through the site. 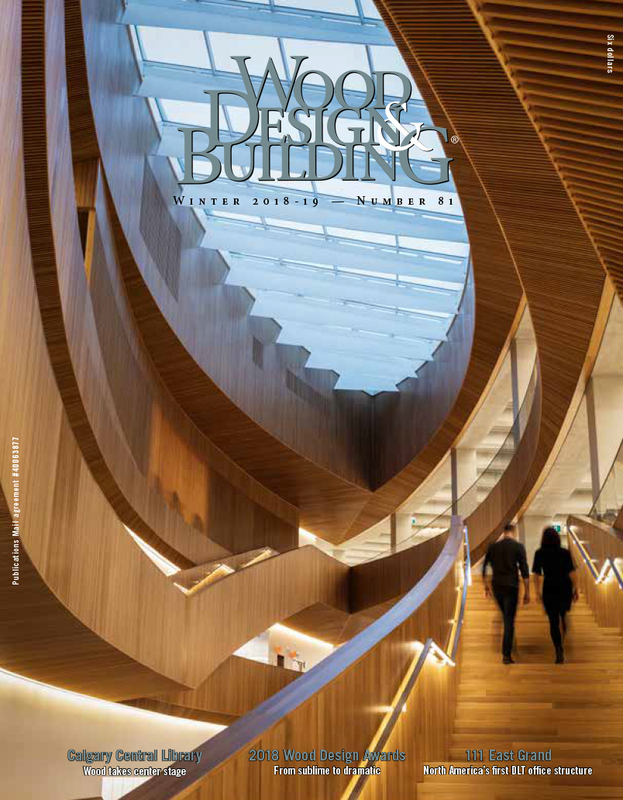 The Fair-Haired Dumbbell building sits squarely in the center of the action and doesn’t shy away from attention. 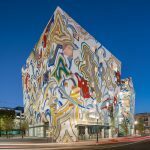 The project consists of two canted six-story towers clad on all eight sides in hand-painted original artwork by LA-based artist, James Jean. 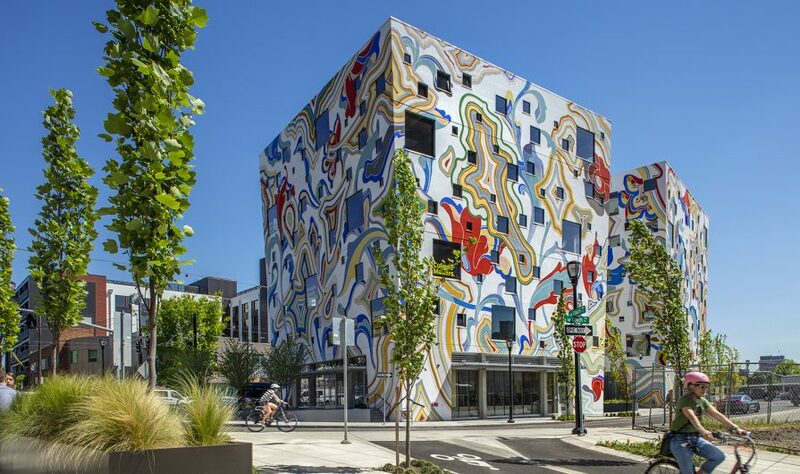 The building was initially conceived of as two “presents” to the city of Portland: it is “presented” on a podium, while the artwork represents the giftwrap. The artwork counteracts the gray of the city, the streets, and the skies, and causes passersby to take notice of the building. A partnership was struck with the Regional Arts and Culture Council (RACC), to commission the work, which showcases cross sections of a thundereggs (Oregon’s state rock) and geodes. 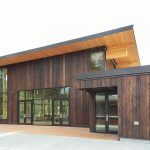 The structure is composed of glulam beams and columns, made from wood procured in Vancouver, WA. The heavy timber post-and-beam perimeter has a two-hour fire rating for the walls and provides increased ductility in the event of an earthquake. At each level, sky bridges connect the mirrored 4,000-sq.ft. 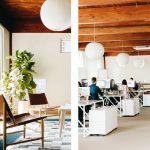 office spaces, giving the creative companies who work there the flexibility to build out their own floor plan to meet their specific needs. 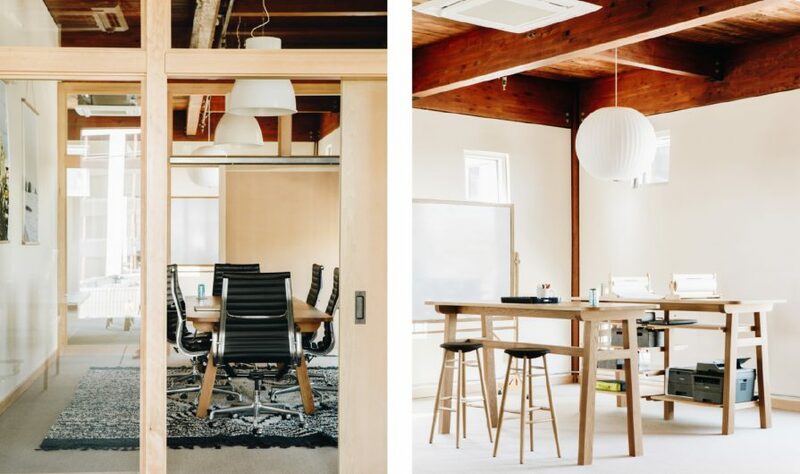 Since no two elevations are the same, tenants and visitors alike take in impressive views of Portland’s many angles through windows of varying sizes. At the ground floor, the project complements the neighborhood with unique retail offerings and creative landscaping.